The Simpson family is the furniture instead of the characters on the couch: Homer is the couch, Bart is the left lamp, Lisa is the right lamp, Maggie is the painting above the couch and Marge is the TV antenna. Couches comes in to sit on Homer and painting-Maggie tilts herself once they're settled. 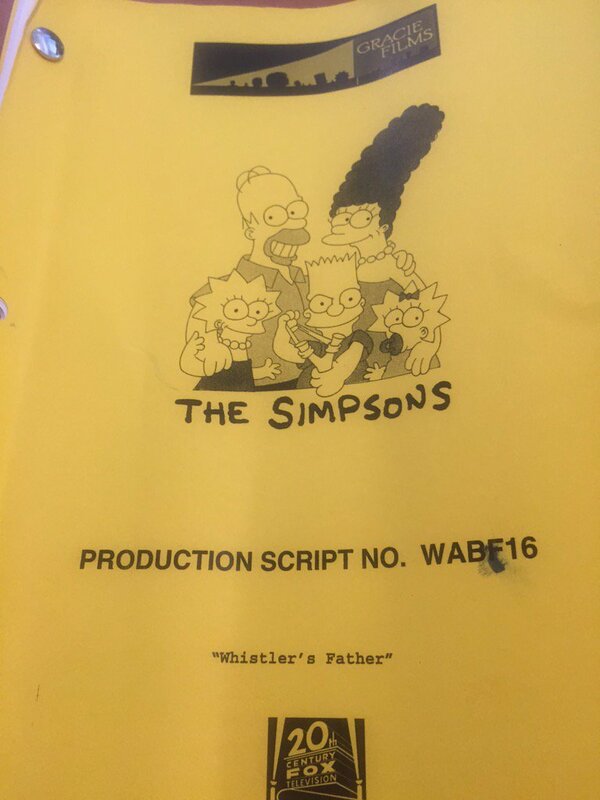 "Whistler's Father" is the 3rd episode of season 29. The episode aired on October 15, 2017. 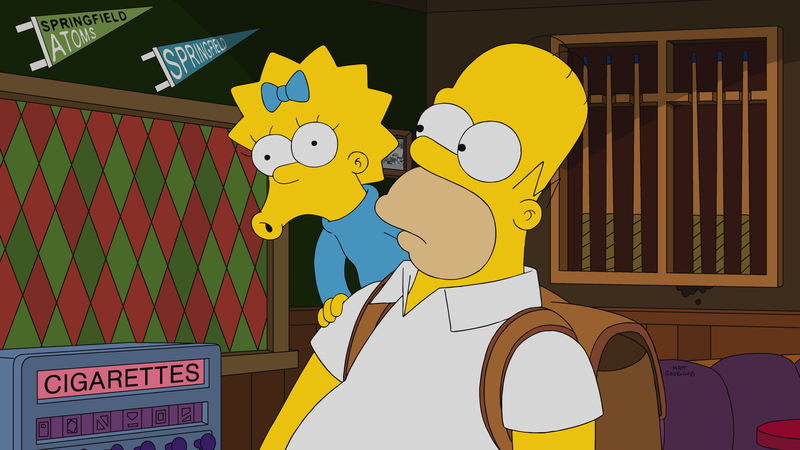 "Homer discovers that Maggie is a whistling savant and launches her baby-celebrity career. Meanwhile, Marge impresses Fat Tony with her interior design taste, and he hires her to style his brothel." Marge is having an evening with Luann Van Houten, Bernice Hibbert and Helen Lovejoy, and asks Homer to take care of Maggie. The women critizes her sense of style is like visiting The Flintstones'. Meanwhile, Homer discovers Maggie having a talent, being a whistling savant. Homer starts dreaming of using her talent to become famous, while Marge thinks about her tastes, and resolves to decorating a late pick up room for Springfield Elementary unlike any seen before, with Lisa remembering her there never being one. 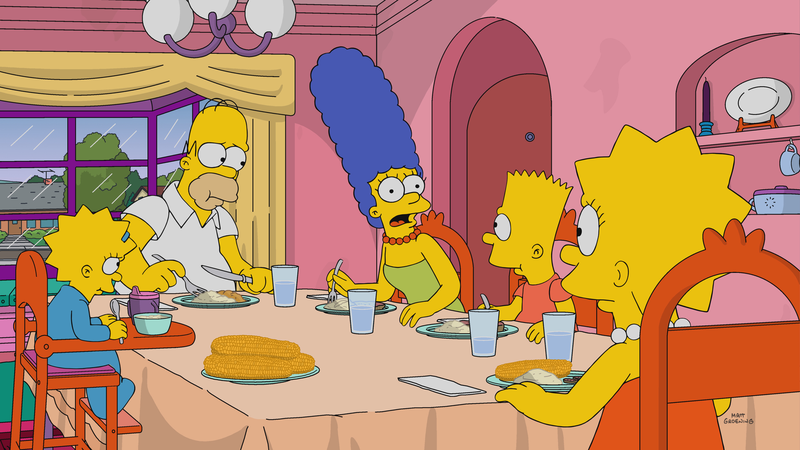 The Hibbert family changes idea on Marge's style, but Helen is not convinced yet, while Fat Tony appears with his son, offering her a job appreciating the work she did. At Moe's Tavern, Homer tried fooling the guys, but Grampa unveils his trick, telling the story of his whistling talent being stopped by a performance going wrong, and asks Homer to bring her to become popular like he wished he become. They bring Maggie to the Springfield City Zoo, to teach her new whistles, and Bart is disappointed he's the only son not to have talent, while vultures try to take Grampa, unsuccessfully. 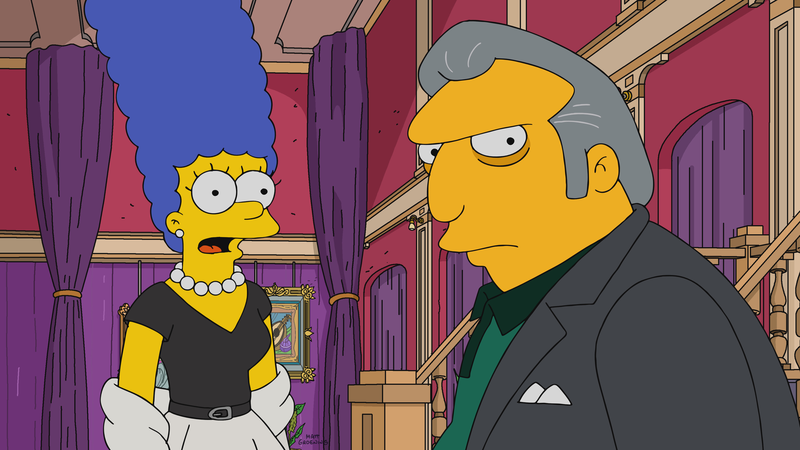 At the Springfield Post Office, Fat Tony airs Marge to redecorate it. Get It and Regret It Hardware store a family tries a couch, imitating the family's couch gags, and Squeaky Voice Teen tells them they've to buy it after trying the couch, while Marge buys stuff to redecorate the Post Office, but she descovers that Fat Tony turned it into a whorehouse. The family, reunited to eat, is hiding secrets from each other, including Santa's Little Helper and Snowball kissing each other. Homer brings Maggie to Channel 6, where the Hot Shot Tots Springfield Audition is held, and finds out how the biz works and tries to convince Maggie to stop but she refuses, while the women discover what the post office turned into. Marge convinces Fat Tony to close the whorehouse down, while Maggie, in front of the public, can't whistle anymore, due to a tooth growing in her mouth. Back at home, Homer says good night to Maggie, telling her to hide any other talent she has. When he's gone, she pulls out a beautiful black and white painting of Homer. 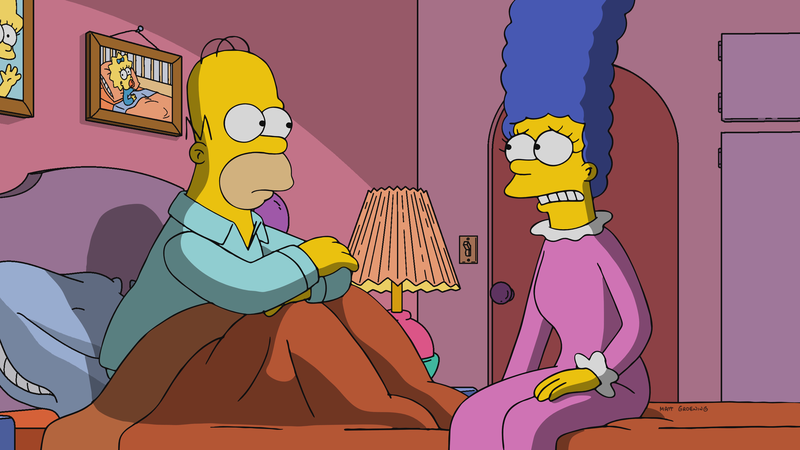 In bed, Homer and Marge tells each other the secrets they held from each other, except Homer finds out Marge is letting up his pants, making him think he's fitter. It was scheduled to be the Season premiere as episode 619 but now it's "The Serfsons". 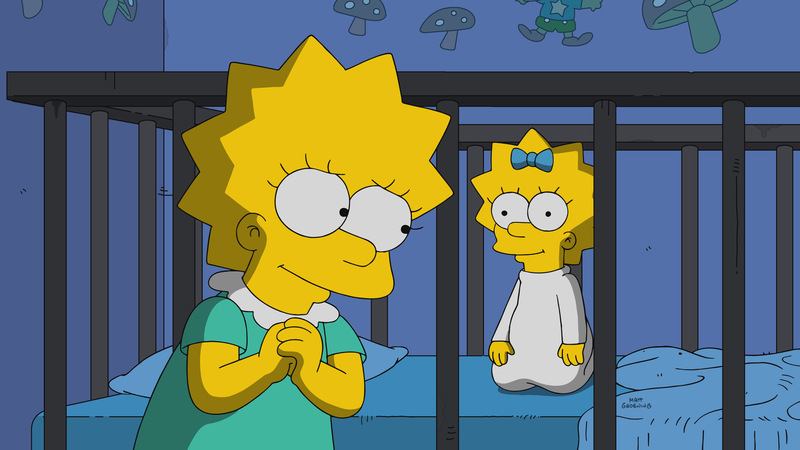 However, Al Jean's tweet may have referred to the production order of the episode instead. Modified on May 21, 2018, at 19:49.